Expectations. We’ve all had experience with them. Whether they were set for us, or we made for them for other people, everyone knows a little something about expectations. They can make or break us, literally. 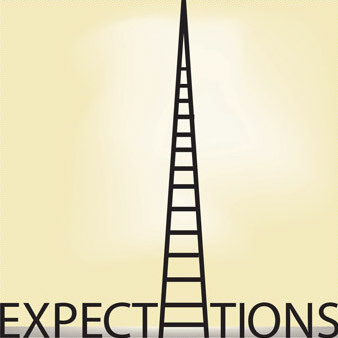 Sometimes when expectations are set, we push ourselves to reach them and thus are successful, but when some expectations are too high, disappointment is usually the main result. Being a junior in high school with very involved parents, I have had first had experience with expectations. Of course every parent has expectations for their child- have manners, be kind, get good grades, make a difference- but to be completely and utterly honest, there are many times when I feel like the expectations that my parents have for me are the reason of my unhappiness. I spend so much time trying to live up to what they want, that I don’t do what I want- what makes me happy. There is no doubt that they only want what is best for me, but at the end of the day to truly be happy, the only expectations I need to live up to are my own. Recently in English class, in preparation for the upcoming AP exam, we read an essay prompt that was a father’s letter to his son. In this letter, the father (Lord Chesterfield) writes about how important reputation and knowledge are. He expects his son to be the best of the best because his son reflects his parents. While reading through this letter filled with expectations, I couldn’t help but think about a recent event that occurred that dealt with expectations in my own life. The March SAT scores were recently released and well, to be frank, I didn’t do as well as I- or my parents- anticipated. My score dropped by 70 points from the last time I took the test and I was quite disappointed in myself. However, my parents’ disappointment was much more than mine. After crying through a gruesome lecture about how much better I could have done and what I should have done instead of apparently “wasting my time on frivolous things”, I laid in bed reflecting on these expectations my parents held for me. In some weird way, my expectations encompass my parents’ expectations for me. They want me to be successful in any and every manner, and as do I. However, I also want to show them that I am capable of the things they tell me I’m not good enough for. I want to say “Remember when you lectured me about not doing something good enough? Well look what I can do now.” I want to prove that I am good enough to surpass their expectations. But other times I want to prove that I don’t have to live up to their expectations to be happy or successful. The bottom line is that: it’s all up to me. How hard I want to work for something, how hard I want to push myself, that’s up to me. The only way I can be happy with my results is if I work for myself and myself only. I have to work to make me happy. 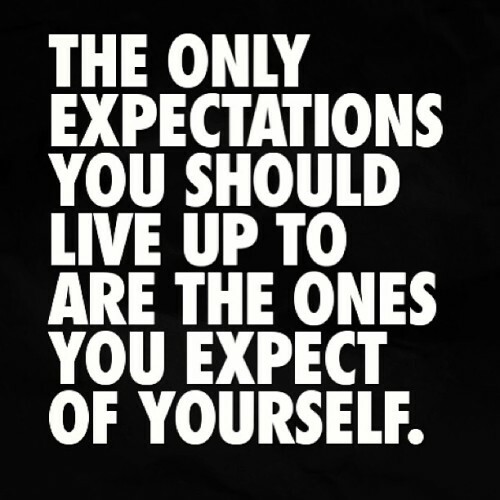 Go out and make your own expectations. Ones that you will be proud to reach. Ones that will show the world how good you are. It’s your life, so live it well.